Great wireless coverage outside doesn’t always mean great wireless coverage inside homes and offices. Wireless carriers have done a good job on improving outdoor performance with more cell sites spread across cities and even into rural areas. They have also improved dropped call rates in most major cities. In fact I hardly ever lose a call now due to a poor signal, unless I am in a zone that they just have not figured out yet. But poor in-building coverage continues to be a problem for all carriers, even the long term incumbents who have robust networks. It does not matter whether you are serving offices, commercial buildings, condominiums, apartments and homes, there is an issue that needs to be addressed. That’s indoor wireless coverage. Our cell phone numbers, voice calls, text messages and email addresses have increasingly become a way of allowing us to stay connected no matter where we are. We expect that our wireless devices should work inside our homes and offices, in fact we demand it. But building materials like concrete and tinted glass, and building locations in shadowed areas, can frequently degrade the cellular signal or even stop cellular, 3G, 4G, GSM, CDMA and PCS signals from penetrating into your location. Your smart phones don’t work in meeting rooms, home offices, warehouses – the list goes on. Your productivity suffers as a result and business is delayed due to poor signal levels. It is usually the building materials that were used to construct the building that is the cause. At the very least the signal is weakened making calls difficult. There is a solution to this problem, however it means that either the building owner or the carrier must spend some money installing a wireless repeater. Cell phones and other devices like iPads, iPods, iPhone’s, Blackberry’s, and G1 Android’s are fast becoming a way of mobilizing the workforce. IT shops in most companies are equipping their employees with these devices to improve productivity only to be stymied by poor coverage inside buildings. But where you might be willing to put up with two bars of coverage on your cell phone for a voice call, for a wireless data application to work well – a strong signal is required. Improving in-building coverage is a must for ensuring data throughput for wireless devices is maximized, and that those wireless applications that your organization has invested in, work well in the places where they are being used more and more frequently – indoors. There are many companies that provide indoor repeater solutions. Basically these systems capture the signal outdoors and repeat it indoors after it has been amplified. Better voice calls and data rates are found with these solutions. 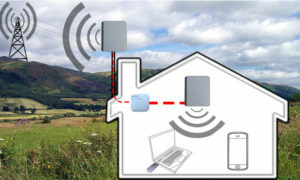 The same process for transmitting voice and data must be applied from indoors. The signal your phone transmits must be captured indoors and retransmitted outdoors so that the carrier can pick up the signal to be processed. Others are employing a WiFi solution to improve data coverage and reduce data bills as well. With WiFi there is no data charge and the user can connect directly to the companies data network after they have authenticated the users device. This is a well known and popular solution for many companies to solve the data issue. Sufficient WiFi transmitters and receivers must be placed throughout the building to provide sufficient coverage. Even in homes, if your WiFi modem is located in the basement, the signal might not be that strong upstairs in your bedroom for example or even outside the home. Locate your WiFi modem upstairs somewhere, where it can transmit a signal that is much less impeded by interference from your home. For more indoor coverage topics, click here. now i understand why my phone works in some locations and not others. We really need to have better indoor cell coverage and data coverage as well. I guess it takes a lot of money.